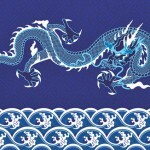 The Chinese Year of the Water Dragon, which arrives on January 23, 2012, promises transformation and good fortune. Of the 12 animals of the Chinese zodiac, the Dragon is the only one that is not encountered in “real” life. It is a mythical creature, considered to be the ruler of Heaven, mists, and rain, and is thus associated with the Emperor. It is also the guardian spirit of the East, a symbol of luck, power, and passion. The Dragon is a pervasive image in Chinese culture. When I was a student in Chinese medical school, I memorized several herb formulas that included the name Qing Long which, roughly translated, means green dragon, blue dragon, or blue-green dragon. I once asked my Chinese teacher for an explanation of the color Qing, which doesn’t seem to have a Western correlate. Was it blue, or green, or bluish green, or what exactly, I asked? “Oh Qing,” she replied blithely, “is the color of the Dragon’s scales when it rises out of the sea and catches the sparkle of the morning sun through the mist.” Get it? If you can take in this mystical image of blessing, and make it part of your consciousness this year, things are likely to go well for you. With the coming of the Water Dragon in 2012, a two year cycle of conflict ends. One of the most auspicious of the five astrological dragons, the Water Dragon carries the stability and abundance of the Earth element, the penetration and creativity of the Wood element, and the depth and immensity of the Water element. So how will this powerful energy play out this year? Well, transformation is certain. The details of how you do with that depend largely on your own animal sign, your personal fate, and your ability to digest this larger than life, and somewhat unpredictable, energy. Below are my personal comments on what each zodiac sign might expect. Please note that Chinese astrology is far more complex than what can be said regarding your animal year, so these are only imprecise generalities. But for what it’s worth, see below. Rat: Last year was full of misunderstandings and wrong turns. But the Dragon is your team mate, and your natural analytical and strategic abilities will actually produce results this year. Follow your heart not your ego, and things will go well. Finances and career should improve, and this is an excellent year for relationships. Remember your mantra though–abundance, not avarice. Ox: The Dragon’s charismatic panache is not your style, and the ups and downs that characterize this year (the Dragon’s natural movement is mercurial,) will make you irritable. You prefer slow and steady. Best use of the year for you is to lie low and store up your considerable energy for next year when the Snake will need you and put you to work. Tiger: You have an alchemical relationship with the Dragon. While Dragon reigns over Heaven, you reign over the Earth. The year will be full of opportunity and energy for you. Just don’t get too carried away with it all. The chief danger for you is exhaustion. Go get your calendar and mark off several weekends for quiet retreat. Do it now, before you get swept up in the Dragon’s dazzling display. Rabbit: You were on stage all year in 2011. Time for a break. You may be feeling a little thin skinned right about now. You can benefit from the luck and prosperity of the Dragon year from the comfort of your elegant warren. Dragon: Lean on your Rat friends for strategy, and your Monkey friends for marketing. Remember, you are a symbol of the benevolent ruler, not the autocratic tyrant. It is up to you to inspire us and be a leader. Be your mystical, elegant, passionate self, and show us again how alchemy works. Snake: You are like a quiet, yin Dragon–wise, artistic, and mystical. You should be gathering your energy this year, observing where the power is concentrating, so you can slip in next year and take over. Horse: You’ll love all the action this year, but the ups and downs may make you unsettled. Your best bet is to team up with a Tiger, who knows how to negotiate this terrain. Your usual friend, the Dog, won’t be much help this year, as he/she will be laboring under a host of complaints. Sheep: Probably a good year to step onto the sidelines. Hopefully this won’t be hard since the Rabbit year was so comfy. The problem is you’re a born diplomat and manager. But your fussy win/win approach doesn’t fit the Dragon’s agenda and you’ll just be dismissed as ineffectual. Please, whatever you do, don’t try to manage the Dragon team. Wait this one out. Monkey: Well, it’s about time. This should be one of the best years in the whole 12 year cycle for you. Your resourcefulness, ingenuity, and clever slight of hand, will be much appreciated. The Dragon is one of your comrades, and will welcome you as part of its legendary team of magicians. Have at it. Rooster: Last year was a test. If you survived without serious injury, you can now forge ahead. Of all the animals in the zodiac, you are the one most capable of delaying gratification for a long term goal. So having done that throughout the Rabbit year, you get to reap some rewards. For the next two years, the force is with you. You should be able to make tremendous strides towards your goals. Dog: All I can say is, “sit, stay.” If, during the last two years, you were able to arrange a comfy bed by the fire for yourself, you should go to it now and stay there. Trying to contend with the Dragon’s drama and charisma (which you see as self-serving,) will only make you irritable and prone to growling and biting. Don’t do it. Retreat is advisable. Pig: Well haven’t you had a jolly time lately! Last year you got to be wine steward at the Rabbit’s elegant dinner party. Everything was just so lovely and there was so much good food. You’ll do fine in the Dragon year, since you can digest just about any kind of chi and turn it into something useful. My only piece of advice is to make sure you lay your plans now for 2013, the Year of the Snake. That’s when you’ll need to retreat, and surround yourself with your most loyal friends. This entry was posted in Articles, Chinese Astrology: Articles, The Year of the Animal and tagged elements, qing, water dragon, zodiac. Bookmark the permalink.